Posters have a long history of use as tools to promote awareness on diverse issues including environmental conservation. A study was done using 39 primary school teachers in Kenya to explore their valuation and use of a wetlands poster during their teaching at school and within the community. The teachers were sampled using a non-purposive, intensity sampling technique. Semi-structured interviews were used to collect data. This article reflects upon the teacher responses to explore the relevance of posters in promotion of wetlands sustainability and areas that need to be improved in poster development, distribution, and use. The teachers’ responses suggest that many of them failed to see the relevance of the wetlands poster in their teaching. Those few teachers who used the poster also failed to make the poster relevant locally and seemed not to have used it to address the pressing local wetland issues and risks. The study suggests the need to refocus on the process of development, distribution, and use of posters in promoting environmental conservation. The process needs to involve teachers so as to integrate and address issues and risks that are relevant to them locally. A poster refers to an illustrated placard that is placed in public places and contains information focused on particular or diverse issues. Posters have a long history of use as tools for outreach to address different issues including environmental education. Like other resource materials, such as pamphlets, flyers, field guides, and books, posters are useful in dissemination of information traversing the ecological, economic, social, and political aspects of the environment. They are usually developed with a view to create awareness using the “show and tell” and “listen and learn” activities, as well as provoking people to focus on issues that affect them (Lotz, 1995, p. 8). They have the potential to give people information about the environment and its associated problems and to help them experience nature more fully. Their development and utilization differs and this could affect the outcomes realized from them. For instance, some are displayed in public places for people to see and read on their own, whereas in other cases, educators interpret the posters for people to understand them better. In both cases, however, posters may stimulate active exploration, debate, interaction, participation, and engagement with local environmental issues. It is necessary to reflect on the effectiveness of the use of posters as environmental education tools so as to improve the process of their development, distribution, and use within the schools and the community contexts. The poster under consideration in this article (shown above) was developed by a number of stakeholders in wetlands conservation including: teachers, wetland scientists, curriculum developers, artists, and museum education officers. It was distributed to 242 teachers from seven out of eight Kenyan provinces who participated in water and wetlands conservation workshops held in nine regional museums (Ndaruga, 1999). The poster contained text, photographs, and illustrations depicting what wetlands are, their value, threats to them, and conservation measures that could be adapted locally. It was meant to be used by teachers to strengthen their teaching about the local wetlands to the pupils as well as the members of the community. The poster development was a response to a need for more environmental education materials in Kenya (MENR, 1994; IGAD, 1999). The teachers were expected to use the poster as a reference material to support their teaching and learning of wetland issues through use of appropriate pictures and illustrations depicting diverse wetland issues. They were therefore expected to address aspects such as: exploring the holistic aspects of wetlands, enhancing relevance of the poster to the local context, linking the poster to the curriculum, projecting the future of human interaction with wetlands, exploring the necessary remedial measures needed locally, enhancing learning using the poster as a cross-curricular engagement with diverse issues, and taking necessary action to conserve the local wetlands (see Tilbury, 1995; Fien, 1993; Gough & Robottom, 1993). The poster development process intended that teachers use the poster to enhance immediate environmental improvement as well as to address the long-term issues of the wetland resources. Posters have the potential to make environmental information easily accessible to many people. They are developed to present a bigger picture about an issue using attractive and stimulating illustrations and text. The information therein may stimulate discussion, generate new ideas, and inspire learners to find their own personal meaning through encounter experiences. Use of posters can be enhanced through enabling learners to find their own personal meaning through critical reflection of a poster’s relevance to the local context (Uzzell, 1998). Interpretation of the wetlands poster by teachers, pupils, and members of the community in this study was regarded as an environ- mental education process that would enhance learners to socially construct meanings through interactions with each other, with the poster, and with local wetlands. The poster was not simply designed to communicate wetlands in- formation, but rather to be used as a tool to stimulate an interest and excitement in learners in the subject being interpreted (Irwin & Milne, 2000). This discussion views poster interpretation, not as a leisure activity, but as one that enhances critical environmental education processes. Posters as education interpretation materials have been undertheorized and very few interpreters have articulated the theoretical assumptions underlying their development and use. They can be considered to be tools of enhancing environmental education processes at different levels. At each level, involvement of stakeholders in the process of development and use of the poster is an important consideration in fostering its valuation and utilization to promote its relevance to addressing local issues and risks. At a primitive level, posters can be considered to pass information using a transmitter–receiver model whereby there is no dialogue between both parties. In this case, the poster is developed by experts with an assumption that the users would positively perceive and respond to the contents adequately. The poster could be displayed on notice boards or other public places for people to use, usually with little or no assistance from experts. In other cases the educators may refer to the poster uncritically by mentioning its contents without exploring its relevance to the local context. This approach presents a distance between the communicator and the receiver and it is difficult to establish whether communication has actually taken place (Hopper-Greenhill, 1994). This linear process is a behavioristic approach to environmental learning (Hungerford & Volk, 1990). Posters can also be considered as tools that enhance meaning making through interaction within a social context. Meaning making in this case can be considered to occur as a process of active engagement with text and illustrations in the act of interpretation and adaptation of the poster to the local context. In this context, the interpretation of posters with pupils and members of the community becomes a process that involves active engagement with the poster contents and real world in local interpretive settings. This process becomes “. . . an educational means towards the goal of social transformation” (Fien, 1994, p. 48) because it encourages dialogue between various people and real objects. Exploration, reflection, and action are mobilized in learners and this leads to social transformation. Engagement with the poster enables learners to bring their own social experiences, emotions, and environmental values into the context. This view can be considered to involve a process of symbolic interactionism (Woods, 1992; Plummer, 1991) whereby human beings are thought to act on the basis of meanings that things have for them. This ascription of meaning is thought to be a continuous process and is a product of social interaction in human society (Woods, 1992; Plummer, 1991). This would imply that the teachers and the learners are able to identify with the issues highlighted in the poster because they apply to their daily livelihoods in their local context and are also able to respond (in an adaptive way) to the messages of conservation prescribed in the poster. This theoretical position would also imply that diverse meanings and actions are evident from teachers, pupils, and the community guided by interaction and contexts. The learners’ critical engagement with the poster contents helps to narrow the distance between them and the interpreted objects (wetlands). This enhances knowing as learners problematize their existential situations (Freire, 1985, p. 56) and seek for appropriate solutions. This engagement requires a greater understanding of the local context including language and society, structure, and history of their reality. The use of posters by teachers in this study was meant to improve teaching by use of visual aids that depict various activities taking place in wetlands, their history, and consequences as well as exploring ways of enhancing their conservation. The proceeding discussion presents the teachers’ perceptions and/or misconceptions with regard to the use of the wetlands poster to realize these expected aspirations. The discussion analyses critically the implications of teacher responses to future aspirations of development, distribution, and use of posters as environmental education tools to promote conservation of wetlands. This case study survey (done in 2001 and 2002) involved 39 teachers from ten schools representing seven provinces of Kenya. From each school, four teachers participated in this research. One teacher per school had initially participated in completion of a questionnaire (which was filled by a total of 54 out of 242 schools). The questionnaire responses were analyzed, and an intensity sampling technique (Patton, 1990, p. 171) was used to sample the ten schools that participated in this investigation. Intensity sampling involves selecting information-rich cases that manifest a phenomenon of interest in an intense—but not extreme—way such as good teachers/poor teachers or above average/below average. In this study, the ten teachers were selected on the basis of either having performed relatively well or relatively poorly—based on data they pro- vided in the questionnaire—in championing for wetlands conservation in their schools and the communities. The phenomenon of interest was the wetland-related environmental activities undertaken locally. The 54 teachers who participated in the first phase of the study using a questionnaire were sampled using a non- probability sampling technique to ensure wider regional and gender participation. The additional three teachers per school who participated in this second phase of poster research were selected on the basis of being senior teachers who were perceived to have a major stimulus on the school academic, social, and environmental policy. The three teachers were used to enhance exploration of teamwork in school to conserve the local wetlands, using various forums and resources, including posters. The main research tool used was semi- structured interviews. 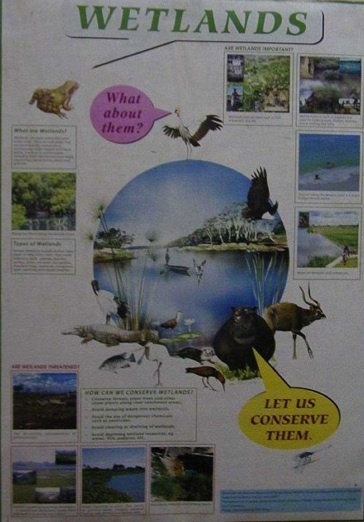 During the wetlands training in 1999, each teacher was given seven posters (see Fig. 1) to use and distribute to the neighboring schools (Ndaruga, 1999). Using a questionnaire, 54 teachers reported having distributed the posters given to the neighboring schools or having used the posters during teaching. However, the data provided was considered inadequate in enhancing understanding of the value and use of posters by teachers and this made it crucial to follow up the issue further using the 39 teachers as reported earlier. During the interview, teachers were asked to explain how they used the wetlands poster in their schools. Out of 39 teachers, 11 reported having used the wetlands poster whereas 28 teachers had not used it. Those who use it mentioned its usefulness in curriculum subjects such as Science, GHC (Geography History and Civics), Agriculture, and Art and Craft. The teachers (number indicated in parentheses) reported using the poster in teaching different aspects of the environment, as documented in the following. Parents enquire about the poster and the teacher explains (1). I use it regularly for knowledge to stick in pupils’ minds and for those currently enrolling in class one (1). The uses of the poster reported here suggest that posters have diverse potentials as teaching resources. The uses mentioned seem to be more inclined toward promotion of understanding and appreciation of the environment. The teachers seem to be in favor of using a transmission approach whereby they dominate while the pupils remain passive. The teachers also seem to take the issues prescribed in the poster “as given” without reflecting on their relevance as well as exploring the local status quo. This may have a negative impact to the learning process because it may impede any critical engagement with the poster to adapt the views expressed in the poster to the real life situation in the local wetlands. This is unfortunate because the poster was developed by a team of eight “experts” and was meant to be a generalized teaching aid. The context in which the poster was developed is more generalized and different from the one where teachers live and work. This study expected the teacher to deconstruct the poster and then adapt it to the local context. This would have entailed generating diverse ideas of the local contextual issues as the learners and the community reconstruct the poster to adapt it to address their local issues. Wetlands in Kenya are threatened by population pressure, agriculture, pollution, overharvesting of resources, and misuse (NMK, 1999, NEMA, 2003, 2004). Teachers in this study also reported experiencing these problems at varying magnitudes in their local areas (Ndaruga & Irwin, 2003; Ndaruga, 2003). These problems are even more severe in drylands where the wetland resources are fewer (Gichuki, 1999). The teachers would have been expected to show evidence of using the poster to address these issues but this was conspicuously missing in this study. The lack of this aspect is suggestive of the failure by teachers to realize the relevance of the poster in addressing these aspects. This observation suggests the need for environmental educators to reflect on the development and use of posters in order to enhance their value locally. Some teachers did not use the poster and the reasons given suggest that they were ignorant of its importance and hence refused to avail it to their colleagues. Some teachers also had misconceptions about the poster that it was not relevant to their subjects. Some of their comments are documented in what follows (the number of teachers in each case is indicated in parentheses). Teachers seem not to realize the importance of the poster (1). These responses are baffling because some of the teachers who indicated that the poster was not relevant to their subjects were Geography teachers, a subject that has many issues dealing with wetlands (RoK, 1992). These responses suggest that some teachers did not consider the poster to be of worth to them. Some teachers only used them to decorate their office walls and the majority of pupils at school had no access to the posters. The responses suggest a great loss in terms of financial and professional input in poster development and distribution. The responses depict the need to refocus attention on development and use of posters as environmental education resources so as to minimize these losses. Of particular importance is to address the suitable approaches when working with teachers to make learning materials such as posters more useful. An idea held by Lotz (1995), Lupele (2002), and O’Donoghue and McNaught (1989) is that there should be more teacher involvement in designing and production of learning resource materials. According to Lotz (1995), a teacher can be sparingly, moderately, or actively involved in poster development. She refers to minimal involvement as an RDDA (Research-Develop-Distribute-Apply) approach where materials are developed through a closed formal system by “subject specialists” or “experts” (researchers) and then distributed to users such as schools, field centers, museums, and so on, where they are adopted by educators (see also Fien, 1993; Robottom, 1987). There is a possibility that some environmental educators still use this approach in development of their education resource materials. Minimal involvement of teachers in education material development may have a negative effect of making the teachers uncritical about their local con- text. The ready-made material may disempower the teacher as well as pupils to passively receive the information without encouraging them to develop a critical stance to their real world. Although the ready-made material may provide vital information to educators, it may give excessive powers to the experts to such an extent that local constructions may remain suppressed even though they may be more relevant in addressing the local environmental crisis. The non-use of the local context in this case may be problematic because contexts are not homogeneous and every resource material should be deconstructed and reconstructed to reflect local reality and relevance. In this study, the teachers seem to have been unable to contextualize the poster to address the local wetland problems. Active involvement in material development entails an open, informal, participatory approach whereby the resource user is involved in generating the text and illustrations that are relevant to his or her context. The teacher in this case is involved in a process of planning, acting, observation, and critical reflection. This process entails encouraging them to participate in determining the contents, nature of material being developed, its educational aims, environmental education in general, the historical context, and in the resource development itself (Lotz, 1995, p. 9). Working together and collective action within a certain context nurtures new knowledge and insights in environmental education through interaction and reconstruction. The resource developed would then be a product of collective wisdom, reflection, and mediation by co-researchers in action. The resource material developers would feel proud to use the resource because it incorporates their collective engagement with real local issues. This is important because it weakens the boundaries between spaces, school, and non-school resources and their integration is centered around group activities and learning tasks (Fien, 1993, p. 22). Lotz (1995, p. 9) also reiterates the need to design education resources in such a way that other resource users can be able to engage with the resource, bringing in their own wisdom and experience to it and nurturing new meaning from that interaction. For wetlands, this may mean presenting the resource in such a way that stimulates a process of engagement for the people to attach their meanings to the resource after interaction with it. This may entail making the resource materials open-ended such that other people or users could generate their reality to it. This promotes adaptation rather than adoption of the poster to the local context. In the case of this study, it is probable that the poster failed in its use because teachers felt it was being imposed on them and did not address the wetland issues as they would have wished it to. Possibly, with the focus of some teachers on passing exams (Stevenson, 1987), the poster may have failed to satisfy their needs. This implies that it is important to explore with teachers how the poster would be useful in promoting conservation aspects as well as passing of exams. It is likely that if these teachers were involved, they could have integrated their local reality within the poster development process and this could have increased its relevance within the school and community contexts. This is an issue that poster development processes should address. Posters still remain popular tools for environmental education because they are considered as potentially able to reach a wider audience, especially because they can be displayed in public places where many people can access them easily. This study demonstrates that teachers considered the wetlands poster valuable in addressing diverse environmental issues. However, its use in promoting wetlands conservation was found to be inadequate. Many teachers did not seem to consider the poster valuable in their teaching both at the school and community levels. Its use also failed to depict engagement with the local environmental issues and risks as characterized by the lack of development of diverse interpretations and actions to conserve the local wetlands. The study suggests that adaptation of the poster to the local contextual issues was conspicuously missing. The study suggests the need to involve teachers (and other users) in the poster production to enhance posters’ relevance to the local context. Where this is not possible, especially where posters have to be distributed to people who were not involved in their development process, the poster should be designed in such a way as to engage users in critical thinking as they adapt it to local context. Where possible, users could be sensitized of the need to adapt posters to the local context in a way that deconstructs and reconstructs the text and illustrations into appropriate locally contextualized responses that address local environmental issues and risks. In this case, the poster only becomes a facilitating tool for learning, a guide toward a new reconstruction of the local issues as experienced by the teachers, learners, and the local community. This is an issue that should be addressed in developing posters for use in teaching conservation of natural and cultural resources. More research is also needed on the processes of the development of posters, human responses to, and the use of posters in environmental education. Fien, J. (1994). Critical theory, critical pedagogy and critical praxis in environmental education. In B. Jensen & K. Schnack (Eds. ), Action and action competence as key concepts in critical pedagogy (pp. 19–57). Copenhagen, DK: Royal Danish School of Educational Studies. Fien, J. (1993). Education for the environment: Critical curriculum theorising and environmental education. Geelong, Victoria: Deakin University. Freire, P. (1985). The politics of education: Culture, power and liberation. London: Macmillan. Gichuki, N. N. (1999). Wetlands biodiversity value and potential for sustainable utilization in arid and semi arid lands of Kenya. In National Museums of Kenya (NMK) Wetland Resources Programme, Publications on biodiversity of wetland ecosystems in Kajiado District 1996–1999. Nairobi, KE: NMK. Gough, A. G., & Robottom, I. (1993). Towards a socially critical environmental education: Water quality studies in a coastal school. Journal of Curriculum Studies, 25(4), 301–316. Hopper-GreenHill, E. (1994). Museums and their visitors. London, UK: Routledge. Hungerford, H. R., & Volk, T. L. (1990). Changing learner behaviour through environmental learning. Journal of Environmental Education, 21(3), 8–21. Inter-Governmental Authority on Development (IGAD). (1999). Summary literature review for the formulation of the IGAD project on environmental education and training. Nairobi, KE: Camfor Consultants. Irwin, P., & Milne, I. B. (2000). Some considerations of environmental interpretation in a trasformatory South Africa. Environmental Education Bulletin, 19, 19–23. Lotz, H. (1995). Programme and resource development in the light of emerging patterns in environmental education. Environmental Education Bulletin, 10, 7–9. Lupele J. K. (2002). Action research case studies of participatory materials development in two community contexts in Zambia. Unpublished Masters Thesis, Rhodes University, Grahamstown. Ministry of Environment and Natural Resources (MENR). (1994). The Kenya National Environment Action Plan: Re- port. Nairobi, KE: MENR. National Museums of Kenya. (1999). The nature of wetlands: A handbook of wetlands in Kenya. Nairobi, KE: NMK, KWS and KIE. National Environment Management Authority. (2004). State of environment report for Kenya, land use and environment. Nairobi, KE: Government Printer. National Environment Management Authority. (2003). State of environment report for Kenya. Nairobi, KE: Government Printer. Ndaruga, A. M., & Irwin, P. R. (2003). Cultural perceptions of wetlands by primary school teachers in Kenya. International Research in Geographical and Environmental Education Journal, 12(3), 219–230. Ndaruga, A. M. (1999). Report of proceedings of in-service training workshops on water and wetlands conservation. Nairobi, KE: NMK. O’Donoghue, R., & McNaught, C. (1989). Environmental education: The development of a curriculum through “grass roots” reconstructive action. Southern African Journal of Environmental Education, 10, 16–24. Plummer, K. (Ed.)(1991). Symbolic interactionism, vol. 1 & 2: Classic and contemporary issues. Hauts: Edward Elgar. Republic of Kenya. (1992). Primary education syllabus, volume 2. Nairobi: Kenya Literature Bureau. Robottom, I. M. (1987). Two paradigms of professional development in environmental education. The Environmentalist, 7(4), 291–298. Stevenson, R. (1987). Schooling and environmental education: Contradictions in purpose and practice. In I. Robottom (Ed. ), Environmental education: Practice and possibility (pp. 69–82). Geelong, Victoria: Deakin University. Tilbury, D. (1995). Environmental education for sustainability: Defining the new focus of environmental education in the 1990s. Environmental Education Research, 1(2), 195–212. Uzell, D. (1998). Interpreting our heritage: A theoretical interpretation. In D. Uzell & R. Ballantyne (Eds. ), Contemporary issues in heritage and environmental interpretation (pp. 11–26). London, UK: The Stationery Office. Woods, P. (1992). Symbolic interactionism: Theory and method. In M. D. LeCompte, W. L. Millroy, & J. Preissle (Eds. ), The handbook of qualitative research in education (pp. 337–404). San Diego, CA: Academic Press. Reprinted by permission of Taylor and Francis (http://www.tandfonline.com).